Robert wondered if he was getting cataracts. Some mornings he could barely see through blurry eyes, but then he'd eat a breakfast taco with jalapeno peppers, drink a cup of coffee, and his vision would be fine. Driving home after a long afternoon on the golf course, Robert would see halos around headlights and street lights as if he had macular degeneration. But then he would take a shower and his vision would be OK once again. Robert went to see his ophthalmologist and the doctor found nothing wrong. The on-again, off-again vision problems continued until Robert learned he had a mid-life equivalent of Bitot's spots. Bitot's spots are an eye condition named by a Dr. Bitot in France in 1863. Caused by vitamin A deficiency, Bitot's spots are tiny specks of keratin protein that flakes off the inside of the eyelid. A malfunction of the goblet cells leads of a deficiency of the protective mucus that carries away keratin and other debris and keeps the lenses clear. Bitot's spots are a condition of a continuum of eye complaints ranging from itchy eyes to blindness. 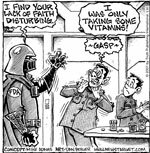 Mild cases of vitamin A deficiency only cause minor irritation. More severe cases of vitamin A deficiency cause Bitot's spots and xerophthalmia. Simply put, xerophthalmia is a condition of dry eyes. The tears are not just water. They consist of three layers, a lipid layer at the bottom that uses fatty acids to make the tears "stick" to the eyes (so the eyes don't dry out every time you look down or turn your head), a middle layer of mostly water, and a top layer of protein and mucus that keeps the other two layers from drying out. When there is not enough vitamin A, the goblet cells fail to produce the mucus needed to keep tears from drying out, and they do not keep the eyes clean. Xerophthalmia symptoms include the blurry vision such as Robert experienced in the story above, and also itchy eyes, bloodshot eyes, eye pain, and, when there is infection, ulcers on the cornea that can lead to blindness. Vitamin A deficiency can cause more than just xerophthalmia. In addition to problems caused by dryness and a lack of lubrication, the inside of the eyelids can grow blotches of squamous skin cells that cause friction when the eyelid covers the eyes. 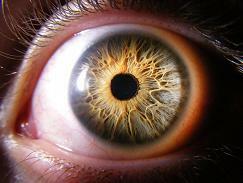 The retina is unable to make the pigments that respond to various frequencies and colors of light. There can be night blindness, and finally total blindness. Usually, vitamin A deficiency also causes dry nail, dry skin, and brittle fingernails. Tragically, every year from 250 to 500 thousand children go blind because of vitamin A deficiency, mainly in the countries of sub-Saharan Africa and Southeast Asia. For less than $1 per child, a single dose of vitamin A can prevent blindness. Organizations such as Vitamin Angels make the treatment available for free, but transportation difficulties keep workers from reaching every child who needs the supplements. In the rest of the world, however, milder forms of vitamin A deficiency cause milder forms of the disease. People who never eat their carrots (or any other orange-colored vegetable) can become vitamin A deficient. People who gain large amounts of fat mass can suffer vitamin A deficiency because fat traps the beta-carotene (provided by foods like carrots) that the body uses to make vitamin A. The US Centers for Disease Control found that American men are more likely to get enough vitamin A than American women. Women who avoid eating vegetables and fruit that are high in vitamin A can suffer vitamin A deficiency after pregnancy, since the fetus "steals" vitamin A from the mother's bloodstream. Both obesity and anorexia can cause vitamin A deficiency. Correcting vitamin A deficiency isn't just a matter of taking vitamin A. Other nutrients are needed for vitamin A to reach the tissues that need it. The vitamin A in food and supplements is soluble in fat but not in water. Vitamin A cannot be absorbed from food unless the meal includes at least 3 to 5 grams (about a teaspoon) of fat. Vitamin A cannot be absorbed from supplements that do not incorporate some kind of fat, unless the product is a vitamin A ester (manufactured with alcohol). People who have any kind of intestinal problem that interferes with the absorption of fats, such as Crohn's disease or ulcerative colitis, will have trouble absorbing vitamin A and will need more vitamin A in the diet. The vitamin A in foods and supplements is actually a "pro-vitamin," a form of vitamin A that is not broken down by cooking, heat, or light due the fact that it is bound to protective proteins. The lining of the small intestine has to convert pro-vitamin A into retinol, which can be absorbed into the vein leading to the liver. High concentrations of alcohol in the bloodstream impede this process, explaining why alcoholics are often vitamin A deficient. Retinol cannot be transported through the rest of the bloodstream in its pure form. It has to be bound to a different protein called retinol-binding protein (RBP), which the liver makes from amino acids and zinc. It is necessary to correct zinc deficiency to correct vitamin A deficiency. RBP breaks down when the bloodstream does not contain enough hemoglobin. Iron deficiency causes RBP deficiency which in turn causes vitamin A deficiency. It's not enough to correct a vitamin A deficiency. It is also necessary to correct zinc and iron deficiencies and to deal with any absorption issues. To avoid iron overdose, eat a small handful of raisins or prunes every other day or start cooking with cast iron skillets, pots, and pans. You don't have to take an iron supplement to get your iron levels up to normal. Take 30 mg of zinc picolinate every day for 30 days. Finish the bottle of 60 capsules, and you will have recharged your body's stores of zinc for six months. Take 25,000 IU of beta-carotene or mixed carotenoids daily for 30 days. It's important to use an encapsulated product. Once you take a single bottle of 60 capsules, you will have built up your vitamin A supplies for a year. Correcting nutritional deficiencies stops deterioration, but there are other products that reverse the damage. The most famous of all the eye remedies is bilberry. 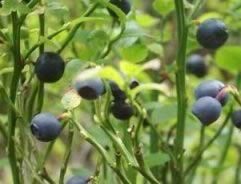 Bilberry became well known as a treatment for vision during World War II. Royal Air Force bomber pilots were given an extra portion of bilberry jam for breakfast, and reported far better night vision as a result. French physicians examined the RAF pilots and found that they had better night vision, better adjustment to glare, and faster adjustment to low levels of light. Although experiments involving Israeli commandos and US Navy SEALS did not find improved vision after taking bilberry supplements, and this evidence is often cited as a reason not to take bilberry, it may be that sometimes you just can't improve on perfect vision. Most people benefit from taking it (and I do, myself). The best formulation of bilberry I've found is a product called Vizu-All Plus by Natural Remedies. It's a little pricey, but it offers a much more bioavailable formulation of bilberry than you get from the cheaper capsules. The product also contains rooibos and cancer bush extracts, but I'll let you in on a trade secret. Those ingredients primarily keep the bilberry extract fresh. And bilberry extract is what you want. Because Vizu-All Plus is a tincture, and not capsules, results are much faster. The makers of the product claim you will see results in 24 to 48 hours, so hold them to their claim. Native Remedies offers a 1-year guarantee, the best in the business, so they wouldn't stay in business if their products did not work. Take Vizu-All Plus as long as you see improvement, and once or twice a year, along with extra beta-carotene and extra zinc as described above, to prevent recurrence of eye problems.